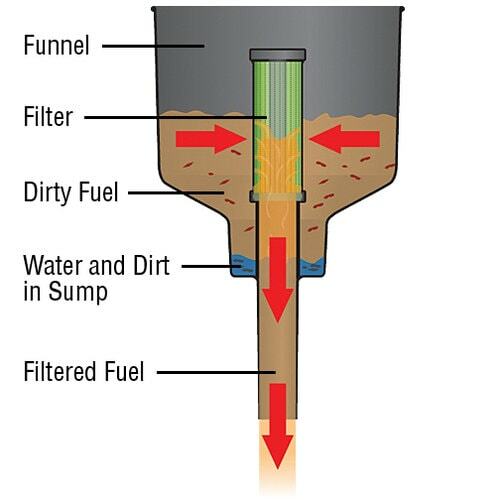 Fuel filter funnels work their magic by pre-filtering dirt, gravel, paper and other debris from most fuels including, gasoline, diesel, heating oil, and kerosene. They also separate water from the fuel. Personally, I regularly rely on fuel filter funnels to separate water out of E-10 gasoline (ten percent ethanol) when phase separation has already occurred. No big surprise, there are a number of different brands available. First things, first. Choose a filter funnel with the appropriate flow rate. as mentioned above different models flow a different volume of gallons per minute. Make sure the funnel's fill tube fits inside the fill point on the boat. When ready to top off the fuel tank, insert funnel into the fill tube and keep the funnel level. Pour the gasoline or diesel fuel into the funnel, but not directly onto the filter element. Swirl the fuel around and around like a gold miner's gold pan. Debris will drop down into the sump. So will water. As water collects, or the flow rate slows, stop refueling. Tilt the funnel to one side to reveal water or dirt accumulating under the fuel. About a cup of water means it's time to dump. Free water, for those unfamiliar with the term, is the collection of water molecules that settle to the bottom of gas can or fuel tank. The opposite of free water is homogenized water, which is simply water that's mixed with the gas. Free water accumulates due to condensation in the air or phase separation due to ethanol additives. when the percent of water in ethanol fuel reaches .05 percent or more, the alcohol and water as a unit drop out of the gas. And because gasoline is lighter than water, it floats on top of the water. Important to note, fuel filter funnels will not remove emulsified water, which restated for emphasis, is droplets of water suspended in the fuel. Also important to know, your refueling system needs to be grounded. Only use conductive funnels (they're black). While the chance of a static fire is greater with gasoline, it's still possible with diesel. Chamois is a soft pliable leather made from sheepskin or lambskin. 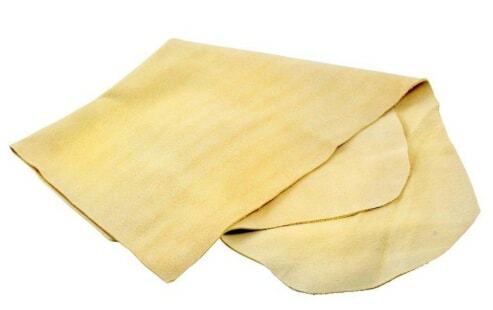 When first soaked with clean gasoline, chamois leather does not allow water to pass through its hollow fibers. Old timers used to take advantage of this by straining gasoline through a chamois rag to pull water out of contaminated fuel. To this day it remains a good expedient fuel/water separator. Consider keeping a chamois cloth in a baggy inside your onboard toolkit. 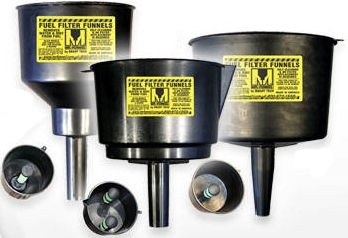 Mr. Funnel fuel filters are similar in design to the Racor, with each model a different size and flowing a different volume (rated in gallons per minute)or pour rate. For five gallons or less of fuel the F1 and F3 are appropriate. For more then five gallons, the F8 and F15. F15 flow up to 15 gallons per minute. The West Marine Fuel Filter Funnel is the Mr. Funnel privately labeled. This is no big secret, it says so right on the box. Its Teflon-coated (non-stick)stainless steel screen filters at 100 microns. For comparison, know that in line fuel filters range from 30 microns to 10 microns. West Marine sells two different models,the medium flow (3.5 gpm) and the large volume(5.0 gpm). 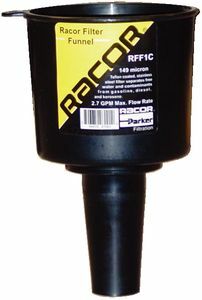 The Racor is a heavy-duty fast flow filter (stainless steel mesh) inset into a funnel. Predictably, besides filtering dirt, gravel and other debris, it separates free water from gas or diesel, with the water collecting in the unit's sump.